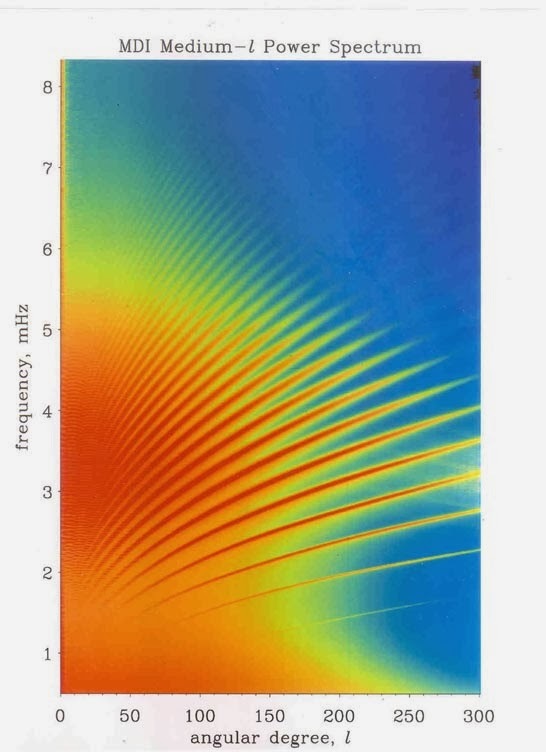 Solar Wave Modeller: Energy Loss of Solar f- and p-Modes due to MHD tube wave excitation. 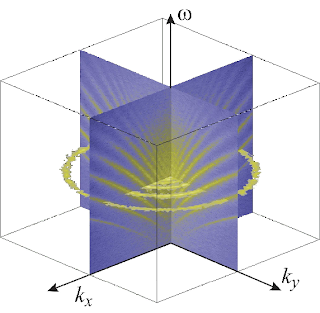 Energy Loss of Solar f- and p-Modes due to MHD tube wave excitation. 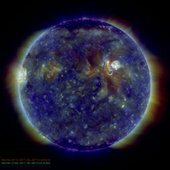 I'm currently running numerical MHD simulations of the dynamics in the solar corona generated by Solar Global oscillations. Today there was an interesting seminar entitled "Energy Loss of Solar f- and p-Modes due to MHD tube wave excitation" as it seems fairly close to some of the areas I'm investigating this seemed to be a must attend event! The talk was a discussion of the generation and propagation of sausage tube waves within the solar convection zone and chromosphere by the buffeting of p modes. Evidence of p-modes and solar global oscillations is nowadays easily observed from satellite imagery. 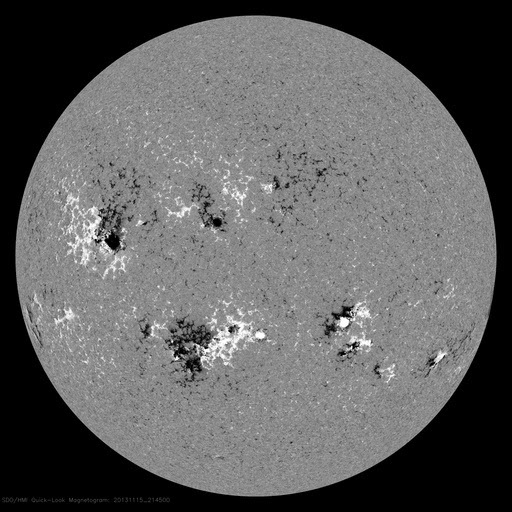 The images below from SDO for the 15th November 2013 are the Magnetogram, HMI Intensity gram and Dopplergram. The Magnetogram shows the magnetic strengths and opposite polarities in the vicinity of sunspots. The right hand image below is a dopplergram. It is interesting to note that the dopplergram shows a suppression of the surface velocity at the at sunspot locations and suggesting that the intensity of p modes are reduced by magnetic fields. The observed power spectrum for p-mode oscillations is shown in the diagram below the intense region at 3.3mHz corresponds to the ubiquitous 5 minute oscillations. It is important to note the ridges present in this diagram. The period versus horizontal wavelength diagram obtained by the Michelson Doppler Imager (MDI) on the SOHO spacecraft. 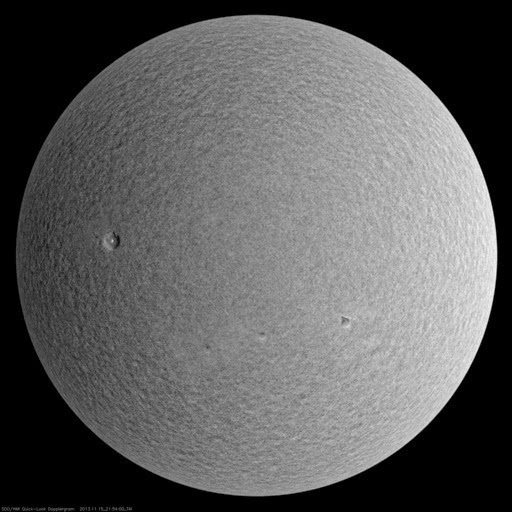 Since only waves with specific combinations (related to the Sun's interior structure) of period and horizontal wavelength resonate within the Sun, they produce the fine-tuned `ridges' of greater power. (Image source: SOHO). The power spectrum obtained from the MDI Medium-l data for the modes averaged over the azimuthal order m. The power concentrates in ridges corresponding to solar acoustic (p) modes. The lowest weak ridge corresponds to the fundamental (f) mode. Simulations may be used to excite a rich spectrum of p-mode oscillations (left), very similar to the MDI diagram (right). The dark line is the theoretical f-mode. The power spectrum above represents p-mode frequency oscillations of the Sun. The x and y axes are wave numbers which are calculated from the degree l of the spherical surface harmonic modes. The z axis is the frequency of oscillation. In the diagram above the rings cut out of the z-axis plane are 3D representations of the p-mode ridges. Six rings equal six modes. Eight rings equal eight p-modes, and so on. The frequency value of the top of the z plane is the Nyquist frequency, the high-frequency limit given by the time resolution of the signal, which here is 8334 microHz. The densest part of the ridge pattern is roughly 3000 microHz. The frequency resolution is 5.71 microHz. This data was acquired using the Michelson Doppler Imager instrument on board the SOHO spacecraft. For solar oscillations, the power is not evenly distributed in the k-omega plane, but instead corresponds to ridges. Each of these ridges corresponds to a fixed number of wave nodes in the radial direction. The ridges are seen here as "rays" in the cut planes facing you. 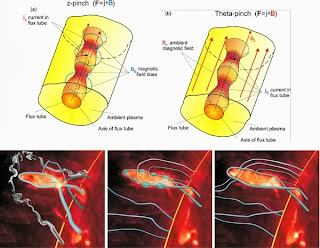 Tube waves propagate along the many magnetic fibrils which are embedded in the convection zone and expand into the chromosphere due to the fall in density with height of the surrounding plasma. 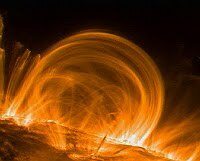 The magnetic fibrils form a waveguide for these waves to freely propagate up and down the tube, those waves propagating upward pass through the photosphere into the chromosphere and enter the upper atmosphere, where they can be measured as loop oscillations and other forms of propagating coronal waves. We treat the magnetic fibrils as vertically aligned, thin flux tubes embedded in a two region polytropic-isothermal atmosphere to investigate the coupling of p-mode driven sausage waves; which are excited in the convection zone and propagate into the overlying chromosphere. The excited tube waves carry energy away from the p-mode cavity resulting in a deficit of p-mode energy which we quantify by computing the associated damping rate and absorption coefficient of the driving p modes. We calculate the damping rates/absorption coefficients and compare them with observations and previous theoretical studies of this nature.